On Thursday I wrote about how Delta revealed the details of their new 767-400 business class, which isn’t what many of us were expecting. What I hadn’t written about at the time is the context in which this was revealed, which is a whole different topic that I find equally interesting. Delta and Virgin Atlantic have a transatlantic joint venture, and they’ve announced that they plan to launch flights from London Gatwick to both Boston and New York JFK in 2020. Virgin Atlantic currently operates some transatlantic flights from Gatwick, but primarily to leisure destinations. In the case of Delta, London Gatwick was their first ever transatlantic destination more than 40 years ago. However, nowadays the only London airport they fly to is Heathrow. The lack of details is interesting… deja vu? I find the lack of details in this announcement to be noteworthy. It’s not stated whether Delta or Virgin Atlantic will operate this route, though that’s fair enough, since the airlines have a joint venture, so they share revenue. More interesting is that they don’t state when they’ll actually launch these routes. They say the routes are coming in 2020, and that details will be announced later this year. They’re not even giving an estimate of when in 2020 they’ll launch, and they don’t even say that flights will go on sale this year. Now, as a general rule of thumb, airlines don’t announce service this far out for good reason. If they’re planning to launch a route, why give competitors an unnecessary amount of advance notice? They’re better off just announcing a route shortly before the flight goes on sale, which still gives them plenty of time to market it. In many ways it sure seems to me like deja vu. In May 2018 Delta announced they’d start flying to India in 2019. The timing of the announcement was clearly politically motivated, as it followed the US and UAE reaching an agreement regarding Open Skies. Much like with this situation, Delta didn’t say when in 2019 they’d start the service, or share any more details. Recently CEO Ed Bastian said the flight would be announced in the “first part of 2019,” but it still hasn’t happened. I’m doubtful it will happen at all, especially given Jet Airways’ current situation. What could Delta’s ulterior motive be? I don’t want to be a conspiracy theorist, though the way Delta is making this announcement makes me wonder if there might be more to this story. Something doesn’t quite add up here. Delta is making a vague announcement that seems similar to their India announcement. They know JetBlue is expected to announce flights to London next week, and those flights won’t be to Heathrow. I’m not suggesting Delta is making this announcement purely to mess with JetBlue, but at a minimum I think Gatwick flights may have been in their plans, and they decided to push forward the announcement just to beat JetBlue. Basically, is it a coincidence that Delta and Virgin Atlantic are prematurely announcing new London Gatwick routes less than a week before they know JetBlue is expected to announce service to London? What say you guys? Wow! Didn’t think of that but i always think competition is a good thing. Isn’t there a big announcement from Virgin Atlantic on Monday for its new a350 seat as well? So many announcements coming up this week! The background pattern on that B6 promo is literally the moquette pattern on seats on the London Underground… surprised not a single av blog has figured this out yet. @Peter – EVERY single blog I’ve read has called out the London Underground seat pattern on the JetBlue announcement. Old news. Well, increasingly I start wondering about Gatwick capacity … this airport has exactly one runway, used for both arrivals and departures. Virgin Atlantic STARTED decades ago with a Gatwick – Newark flight and then later moved all NY service to LHR; it hasn’t been very long since they did this. No mention of that in the announcement. And, when Delta last beefed up their London service, they – too – also served LGW – JFK. No mention that they are RETURNING to the market that they served previously. This is all presented as exciting and new and never seen before. Hype. It’s a good thing. There will be more completion and hopefully put downward pressure on prices on all airlines service between nyc and London. Not a surprise that BA recently decided to up their game in J. 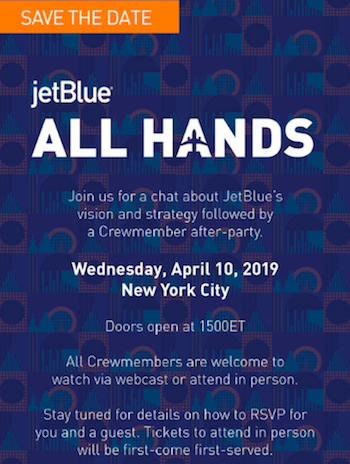 The announcement probably got rushed out to steal some thunder from JetBlue, but one flight a day or so between JFK and Gatwick probably makes sense… I would actually expect to see this launched. Bear in mind Gatwick is far more convenient for a lot of the commuter belt suburbs in the south and southeast of London (Surrey, Kent etc). BA has made (apparently) a success of their one daily service LGW-JFK already and there’s probably room for more capacity from Virgin/Delta. While Gatwick will never have the connectivity of Heathrow, London is a massive metro area geographically, and it’s useful to serve multiple airports. It’s more about F/J than Y. Public rates of J could be 6-10x Y. Companies in the two financial hubs are willing and required by travel policies to pay for those J seats. B6 will likely have some minor impact on J price, but not so much on Y. BA/AA offer too many seats for B6 to disrupt, if the pricing is rational, based on demand and supply. There is so much demand from London to NYC/BOS, its a bottomless pit. I remember in the 1990s so many of us would hop on AA or BA’s late afternoon or 6p flight on a Friday to JFK and overnight back Sunday night. THAT is how easy this route has been for millions historically…. in addition to regular movements and all the massive biz traffice!! The prestige of LHR is over hyped celeb nonsense… LGW works very well! With VS having a presence there, VS or DL metal is not a problem, although I suspect it will be VS. Yes its to steal thunder from B6, but lets be honest. B6 has more than enough feed and loyalty to feed xJFK xBOS transfers. Its going to be huge and DL has the most to lose with this. There’s not much that’s below Delta these days, so you’re probably right that it’s related to JetBlue. I miss the days when Delta had integrity. Ben, I’m curious why you think Delta is less likely to fly to India given the Jet situation… If Jet folds completely wouldn’t Delta be forced to offer more flights on its own metal? Or do you think that the lack of domestic connectivity will make Delta lose interest in the market and will only serve it through partners? Gatwick is not in London. It isn’t even part of metro London. It’s in West Sussex. Other than Caribbean or Las Vegas flights, Gatwick doesn’t even work for Virgin Atlantic. Gatwick is not a business airport. Arguably, Delta could have flown to Stansted, as the landing fees are cheaper there and they probably could have gotten a sweet deal. How can you say LGW dosent work for VS when it obviously does. They wouldn’t have invested in it otherwise. And only snobs say it’s not a ‘business’ airport. And so what if it’s not in ‘metro London’. It’s easier to get to central and east London than from LHR. I welcome the new flights to JFK and BOS and will switch from LHR if the price and schedule are right. I’m not the only one who finds LGW easier and cheaper and quicker to get to than LHR. I thought of JetBlue the minute i read this announcement. Virgin could probably launch flights from Gatwick. It’ll be interesting to see if Jetblue partners with Easyjet for connections to the rest of Europe. TBH, I don’t know how they’d go about it, but I can’t see JetBlue going for anything other than LHR. I could however see them doing something into LCY on A220 (When they get them) but LGW just doesn’t seem very JetBlue IMO. Well, whether B6 goes with 321LRs or a wide body (the plane in their announcement looks wide), their Mint product will beat DL’s 767-400 J seats hands down. Either way, prices in J are going to fall which is great news. Jet Blue also partners with TAP Air Portugal. In fact, I think Jet Blue’s operations at New York–JFK are handled by Jet Blue. Not sure about Boston. I could see Jet Blue announcing New York–London and onward with Easy Jet and then Boston to Portugal and onward with Tap Air Portugal. I certainly don’t think Heathrow is a business airport, Gatwick is just as good. Whilst Heathrow has many travel /access options it can be a pain to get to though, I live near Stansted and public method’s to get to Heathrow are next to non existant. I do fly from three airports regularly and I rate LHR and LGW as virtually equal. The only let down with LGW is the embarrassing coin operated trolleys, tourist to the UK struggle with bags as they have no coins on arrival. Tonight I’m flying STN-DXB on EK and STN facilities are lacking, grubby and dirty. I hear they have big plans to expand and improve, fingers crossed. However at present this airport is stuck in LCC mode. Would love to see the reaction if JetBlue announce Stansted-US flights. If EK can fill two planes a day (from July) I’m sure JB could give it a run for its money. @Tim – JetBlue Mint and Delta’s 767 J (both the current version and the new -400ER product) are all Thompson Vantage seats. Meaning that yes, B6 has doors on the throne seats which is a plus, but in reality the ‘bones’ of the seat are the same. In fact I think A321 Vantage is actually tighter than 767 Vantage. Soft product is better with B6 (as far as I’m aware from reviews, yet to try Mint sadly), and they’ve customized their seats more than DL, but the basic seat behind both of the products is the same. So while B6 may be better service-wise (which I agree with), on a short TATL flight where sleep (and therefore the seat itself) matters most, I wouldn’t say it’s fair that they beat DL ‘hands down’. I don’t think it matters what political administrative division a UK airport is located within: it’s all about access. For now, LGW has direct train access to different markets than LHR’s direct access (let’s set aside the fact that HEx terminates at one of the least usefully positioned of the main London rail termini – though that disadvantage will change when Crossrail opens fully). LGW not only has the Gatwick Express non-stop to London Victoria (the best-positioned station for the West End), but it has direct Thameslink trains – from Cambridge and Peterborough and Brighton, as well as from central London stations including King’s Cross-St Pancras and Farringdon and Blackfriars – and it even has direct trains from cities like Southampton. LHR has the Heathrow Express non-stop from a station on the outer frings of west-central London, or the ponderously slow Piccadilly line stopping at every single suburban station between Hillingdon and central London. It has zero rail connections to anywhere else. There’s a scheme to open up the ex-GWR mainline so places like Bristol can have direct trains – God knows when or if that will happen. And there have been schemes for *decades* to open up LHR to the ex-SWML to Southampton/Waterloo – none has ever got very far. And that’s it until Crossrail, eventually, opens – when a number of central and east London stations (and a few suburban destinations beyond like, er, Gravesend?) will be connected. For many businesses in south-east England, whether LHR or LGW is “more accessible” is entirely a matter of rail links. At the moment, LGW is actually pretty well-connected – and, until Crossrail properly opens, I would argue it is better connected for far more people than LHR. Agree totally, F/J is where the airlines make their money. My point had been to an earlier commenter who had been saying more competition will be great to force down prices, which was an odd comment to make about this already most competitive of city pairs. Even premium cabin seats are dirt cheap when not buying flex tickets, BA club world is frequently available at ~£1500 return from London. So what are airlines doing? I am wondering as well because there seems to be no connectivity out of LGW for Delta. For Jet Blue, of course with EasyJet they do have Worldwide by EasyJet that also partners up WestJet, easyJet and Norweigan. Since Delta I think is a Joint Venture with them, that might be where they might pull easyJet into it as well. 91% of LGW arrivals are ending their journey there – it is not a big transit airport (that was in 2017, and that percentage has been growing rather than shrinking). People flying to LGW mostly want to reach London. Connectivity is of fairly trivial importance. To the LGW haters out there…LGW works fine and you know it. Especially with Gatwick Express you can be in the city in 30 minutes. I don’t understand why people continue to act like Gatwick is some ugly step child or something. Sure Heathrow might be more convenient but Gatwick is almost always cheaper. I think it’s about time that someone (hello Virgin) tried to break the BA monopoly and extortionate prices on the Gatwick – Bermuda route. Here in Boston, Delta / Virgin Atlantic have billboards up downtown touting their upcoming Gatwick service, so they have planned this announcement for at least a little while. Billboards take a while to get designed, sourced, approved, etc. Could this signal that the LGW service will be served on Delta? FWIW our preferred route to London has become BOS-LGW on Norwegian as the pricing is stable, premium is $1050 return even if booking at short notice and we grab the train to Victoria and walk across the street to the Hilton/Plark Plaza… Unless JetBlue/Delta can beat that price point why should we shift ? Even if you have to go further into the city Victoria is somewhat better connected than LHR/STN – I love LCY but most of my events now are closer to Victoria Station. This is speaking as a Flying Blue and United Platinum member – the cost savings blow away any alliance benefits.